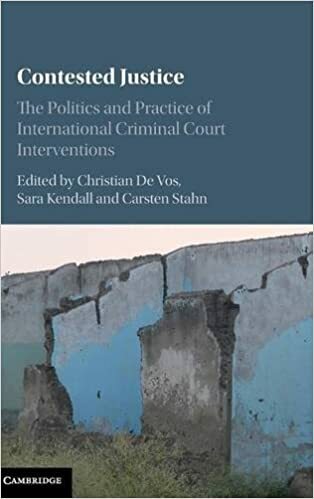 CONTESTED JUSTICE: THE POLITICS AND PRACTICE OF INTERNATIONAL CRIMINAL COURT INTERVENTIONS, by Christian De Vos, Sara Kendall and Carsten Stahn (eds). Cambridge, United Kingdom: Cambridge University Press, 2015. 526pp. Hardback $140.00. ISBN: 978-1-107-07653-2. Open Access $0.00. ISBN: 978-1-139-92452-8. Reviewed by Chris Kendall, Department of Politics and Government, University of Puget Sound. Email: ckendall@pugetsound.edu. The year 2002 represents a turning point in the evolution of international criminal law. In that year, the sixtieth state ratified the Rome Statute, bringing into being the International Criminal Court (ICC). For the first time, a permanent tribunal with an independent prosecutor would investigate and prosecute crimes of concern to the international community, namely war crimes, crimes against humanity, genocide, and the (at the time still undefined) crime of aggression. Fifteen years later, scholars, lawyers, and activists are still debating the merits and pitfalls of such an ambitious project. CONTESTED JUSTICE is the most recent contribution to this debate, and one of the best. Drawing on more than a decade of the Court’s actual functioning, this volume succeeds in its goal of moving beyond a Hague-centered, hermeneutic account of international criminal law’s doctrinal development toward a broader critique of the ICC’s interactions with the societies in which it intervenes. Contestation is the name of the game in this volume, and the domains of contestation are vast, nuanced, and intermingled: law/politics, retributive/restorative justice, prosecution/peace, international/local, victims/perpetrators, victims/non-victims, society/state. This volume demonstrates that the ICC is a field of “contested justice” not just in the legal sense, but also in the form of domestic and international political contestation. Two themes emerge from this complex web. First, the ICC is not merely international in the traditional sense of “interstate.” Rather, it represents a global force that attempts to achieve compliance with international norms while claiming to embrace domestic diversity and the needs of the local. Second, the ICC is not just a criminal court. It increasingly seeks to move beyond a legalistic, retributivist, prosecutorial approach to criminal law toward a more politically-informed, restorative, transitional-justice model of conflict resolution. These two themes are themselves intertwined. Post-conflict societies are often unable or unwilling to adopt whole-heartedly a prosecutorial approach to justice, and the ICC (predictably) lacks the institutional expertise or bandwidth to fully meet the needs of diverse, fractured societies. The ICC—and the entire liberal internationalist endeavor atop which it sits—remains in precarious equipoise, held in place by these tensions. The volume’s authors address these tensions from multiple disciplines (anthropology, political science, sociology, law) while drawing on a wealth of professional expertise (academics, lawyers, NGO activists, and intergovernmental organization officials). This diversity of inputs underscores the volume’s impressive coherence. Collectively, the editors and authors have produced an engaging, nuanced debate with multiple points of entry to a fascinating topic. Luckily for the reader, the editors have divided this hefty volume into four parts, each addressing a specific issue or concern relating to the ICC. The first section addresses the ICC at the highest theoretical level, focusing on questions of legitimacy and the tension between international law’s universalist claims and the needs or desires of local populations. The next two sections focus on the empirical record of the Court’s interactions with domestic political actors and victims. The final section brings the discussion full circle, attempting to reconcile the ICC’s record in criminal investigation with its [*8] broader mandate to spread the rule of law while recognizing legal pluralism. First, whom exactly does the Court serve? The first chapter, by Mégret, shows how the ICC attempts to build legitimacy by “speaking for” multiple constituencies. Most importantly, the Court claims to speak for victims—and in so doing tries to move beyond a principal-agent relationship with its creators, States Parties. Of course, this only raises additional concerns, including the fact that speaking “in the name of” a third party involves displacing that party to a certain degree. As Stahn’s contribution evidences, these types of rhetorical moves open the Court to charges of imperialistic behavior, especially paternalism and a lack of responsiveness to the needs of the local populations most directly influenced by ICC interventions. Imperializing behavior is, of course, much more than rhetorical. Stahn also demonstrates how the episodic nature of ICC interventions risks creating structural dependencies that linger longer than the Court’s institutional attention span. “Speaking for victims,” meanwhile, reinforces the Court’s focus on criminal accountability, and this heightens the difficulties the ICC faces in responding to local needs. The ICC operates on a principle of complementarity—it does not assert jurisdiction where local justice systems are able and willing to try cases. This theoretically should reduce accusations of imperializing behavior. In practice, however, complementarity has created an additional source of conflict between an international court that sees prosecution as the only acceptable outcome to mass crime and local jurisdictions that may favor other transitional justice mechanisms. This is a theme that resonates throughout the volume: the demands of local politics repeatedly clash with the legalism that buttresses the Court’s legitimacy. The question becomes, then, the extent to which the ICC can adapt without compromising its legal role. Koller’s chapter cautions against any rapid transformation. After all, it would be unrealistic to expect international tribunals to achieve transitional justice goals single-handedly in the face of domestic intransigence. In this sense, international tribunals are doing as well as can be expected, and domestic actors should take their rightful share of blame. Ramji-Nogales and Newton, on the other hand, are much more critical in their respective analyses, offering specific recommendations for systematic changes in ICC behavior. Ramji-Nogales argues for “bespoke transitional justice” that would position any prosecutions in a broader, locally-tailored set of transitional justice measures so as to “reconstruct local social norms opposing mass violence” (p. 112). Newton urges the Office of the Prosecutor (the “OTP”) to develop a systematic process for invoking the Article 53 “interests of justice” clause of the Rome Statute in situations where prosecutions might do more local harm than good. The focus here is balance among a myriad of competing interests, not simply trials. This initial section sets the tone for the volume: a recognition of the ICC’s limits, and the difficulties attendant in identifying local interests (let alone accommodating them). These limits become even clearer in the second and third parts of the volume, which draw on a decade of Court activity to examine the real-world effects ICC interventions have had on specific segments of society. These chapters demonstrate in stark relief how the complicated relations between the ICC and domestic politicians can undermine the Court’s claim to legal impartiality, as well as how these relations can have potentially detrimental outcomes for the non-governmental activists on which the ICC relies. The first two chapters in this section provide in-depth accounts of how an international legal institution can succumb to political imperatives. In Oola’s analysis of the Ugandan peace process, we see—in echoes of earlier chapters by Mégret and Stahn—the ICC serving its own institutional need for legitimacy by again taking a hard line in its interpretation of complementarity. Although complementarity was envisioned as a mechanism to protect state sovereignty, here it morphs into “positive complementarity”—a carrot the Court and its supporters can use to demand conformity with a [*9] prosecutorial approach to post-conflict processes. Oola also shows how complementarity has (perversely) resulted in selective prosecution, as Ugandan government officials learn to access ICC expertise while maintaining control over prosecutions. Complementarity does not come off much better in Kambale’s chapter on the Democratic Republic of Congo. There, complementarity was intended to create a division of labor, with the ICC taking on the more politically risky task of prosecuting those bearing the greatest responsibility for mass crimes. As states and human rights activists became increasingly impatient for the start of trials, however, the ICC shifted its focus from these more difficult cases in pursuit of easier wins. The final two chapters in this section focus less on the political maneuvering between the ICC and politicians and more on a third set of actors: civil society advocates. Mue and Gitau’s chapter demonstrates how these actors are critical to the functioning of the ICC at every stage of the process, from collecting information prior to ICC intervention, through the vital work of witness protection efforts, to the domestic follow-up litigation that ensures a modicum of compliance. The authors demonstrate how this work opens NGOs to the same allegations of neocolonialism that the ICC itself faces, but also how NGOs are key to defending the Court against such charges and ensuring any measure of ICC success. Given the importance of some civil society actors as “intermediaries” between the Court and the societies in which it intervenes, one might be surprised to find they are not given a formal role in the Rome Statute. Instead, as Clancy explains in his chapter, the role of intermediary as a third force distinct from the Court or domestic governments has developed over time, often in reaction to violence against these same intermediaries. These various third parties are, in the words of Mue and Gitau, “vanguards for justice” (p. 217), and such a role comes with risks which the ICC has only haltingly recognized. These two chapters highlight how the ICC, even when attempting, in earnest, to lighten its footprint and engage “the local,” can still have a profound and often destabilizing influence on the groups with which it interacts. We see this problematic relationship between the Court and domestic populations in full force again in the third section, which deals with the Court’s relations with the victims of mass crime. The section’s theme of “practices of inclusion and exclusion” concerns itself not just with access to the Court, but with access to the very designation of “victim.” As these authors make clear, the focus on the individual victim, and how to compensate that victim, is complicated by international criminal law’s failure to fully embrace the societal links among victims, non-victims, and perpetrators. In short, the evolution of international criminal law from a focus on the state to a focus on the individual resulted in a missing link: the community. Other authors continue this focus on the basic underlying mismatch between ICC initiatives and broader restorative and socioeconomic dimensions of conflict resolution. Fletcher, for example, argues that the “imagined victim” served by the ICC demands retribution first and foremost—often in direct contradiction to the demands of actual victims. Hellman likewise demonstrates that trials are an insufficient solution to mass crimes, and that much of the Court’s work must be focused on communicating with victims and with the broader community so that the regular operations of the Court do not undermine its mandate. Both authors underscore this inherent instability in the Court’s role: namely, that legal procedures and modalities sometimes undermine less legalistic interpretations of justice, such as when trials undertaken with procedural safeguards result in acquittals or what victims perceive as lenient sentences. What we have, though, is more than a mere failure to communicate. Kendall (no relation to this book’s author) questions whether a legal body can achieve a more meaningful outcome, and instead calls for a wholesale transformation of modalities. She argues that any restorative turn in justice should take the form of “legal humanitarianism” that adopts a post-punitive, humanitarian mode while recognizing the jurisdictional constraints imposed by a criminal law framework. Her proscription seeks to address many of her co-authors’ concerns about a broader socio-economic approach to reconciliation. She is skeptical, however, that the Court’s current institutional makeup is equipped for this. Alas, it is also unclear whether the broader international community is even interested in taking up such a project. Moreover, even when states, donors, and activists do move in a more humanitarian direction, they increasingly take on the same indicator-based, neoliberal-influenced view of progress that has come to dominate foreign aid and development assistance generally—and of which authors such as Clarke are skeptical. When money flows, politics and personal interest invariably are activated. These chapters do not paint a rosy picture, nor is it clear that they offer a way out of the dilemma. The title of the fourth and final section, “Politics and Legal Pluralism,” could describe the entire edited volume, and suggests the lack of a unique focus for this subset. This in no way reflects poorly on individual chapters, but suggests that readers might consider this final section a “grab-bag” of contributions that relate as much to the volume as a whole as they do to the other chapters with which they have been organized. De Vos’s chapter revisits one of the most important themes of the volume: the ways in which complementarity has turned from an exercise in sovereignty to an exercise in incentivizing standardization. The standardizing effect has been enabled by the transnational epistemic community pushing for and assisting states (here, Uganda and Kenya) to ratify and incorporate the Rome Statute, often using model legislation and “best practices.” We see a similar dynamic at play in Labuda’s chapter on the Democratic Republic of Congo. He focuses on the country’s response to competing international and domestic political interests, and shows how variations in application of the Rome Statute results not in adaptation, but rather in “misapplication.” Easterday’s chapter on Colombia portrays a government instrumentally using the language of international criminal law as a way of focusing the domestic narrative on crimes committed by non-state actors. The reader is left wondering whether a vernacularized incorporation of international criminal law is ever meaningful, or always simply another political tool for domestic actors. The final two contributors expand the debate from one focused primarily on legal standardization across space to one that concerns continuity across time. In Kersten’s analysis of the ICC’s intervention in Libya, we see how the shifting political attention of Western powers and concomitant lack of sustained focus by the United Nations Security Council left the Court out on a limb, so to speak: once committed to intervention, the Court had no one to enforce its mandate. In contrast, Méndez and Kelley articulate a vision of the ICC as an institution [*11] whose importance is located in its permanence. Their chapter is perhaps the most optimistic of the volume, as they see the Court taking on a deterrence role that may contribute to future peace efforts. Taken together, the volume’s authors make a strong case for the ICC (and international criminal law more generally) to recognize the political constraints of judicial activity in post-conflict societies. An international organization that was supposed to encourage the rule of law while acknowledging local differences has slowly (and without clear legal requirement in the Rome Statute) become a means for encouraging a single, retributivist approach to justice. Competing concerns, such as respect for legal pluralism, vernacularization of international norms, or local democratic control, have at times been swept away. Ironically, this has made it more difficult for domestic political actors to fully embrace the very judicial reforms sought by the ICC; doing so opens these domestic actors to accusations that they have sacrificed sovereignty. Paradoxically, the authors’ collective solution amounts to a call for even greater Court engagement with local politics. And in this lies perhaps the volume’s most important contribution: it moves the discussion well beyond the increasingly stale “peace versus justice” debate. The majority of the authors recognize that law and politics are inseparable, and that legal solutions must take local political needs into account if trials are to be meaningful, and not portrayed as Western-imposed victors’ justice. This leads to a quibble. Although the volume’s title is “Contested Justice,” there seems little disagreement on the overall appropriateness of the ICC. There are questions about the Court’s legitimacy, to be sure, but most of these seem to originate from within a discussion of true believers. While they might disagree on the way the Court functions, there seems little concern about its ability (or lack thereof) to become relevant outside of the region where it is currently most active: Africa. There are nods to the Court’s activities in Afghanistan, and one (impressive) analysis of the Court’s engagement with Colombia. Beyond this, though, there is no systemic analysis of the Court’s wider role in an increasingly post-Western world. Taking this a step further, it would have been illuminating to hear the contributors grapple with the current moment in international politics, one which after the 2008 financial crisis sees a liberal international order under incredible stress. After all, that order is the foundation upon which the ICC stands. It is unclear how an institution so deeply imbued with liberal ideology will deal with the international system’s increasing population by illiberal regimes, or the continued rise of a China whose interest in liberalism is purely economic. These, however, are more commendations than critiques of this book. In effect, they ask the editors to begin work on a second volume. In the meantime, this volume is essential reading for scholars and practitioners in the field of international criminal law or transitional justice. And while it is unlikely any faculty member would adopt the entire volume for a course, the nice mix of theoretical and empirical contributions means this volume could serve as a rich source of material for instructors looking to integrate selected chapters into graduate or advanced undergraduate courses on international or comparative law and politics or courses on human rights. This is particularly true for those teaching in political science departments, since it can be difficult to find international law materials that adequately address political considerations as effectively as this volume’s contributors. The fact that the editors have made this available under an Open Access license only increases its appeal. Perhaps most importantly, this volume should be read by anyone working at or within the ICC itself. The contributions to this volume do not pull their punches—they highlight the myriad ways in which a well-meaning institution can fall short of its goals, or even undermine those goals by succumbing to international and domestic politics. As the authors of this volume rightly point out, the Court is legally beholden only to itself and its States Parties. Yet its true [*12] moral constituency consists of the societies who have suffered from mass conflict, and into which the ICC seeks to intervene meaningfully. Those recipients of the ICC’s activities have relatively little control over the Court’s work product, so it is imperative that critiques such as those in this volume receive the due attention of the Office of the Prosecutor, judges, and other ICC officials. © Copyright 2018 by author, Chris Kendall.